By Agus in Mobile. Updated on November 23, 2017 . GIF animations are small compressed files of looping fun that are more often than not, used for memes. While you can create GIFs straight from a browser (here’s how you do it on Chrome) or from web apps like these, these days we prefer to have tools that can make or edit GIFS of our personal photos or videos. If you are part of this group, you’re in luck, cause we have the iOS mobile apps to help you make, edit and share GIFs right from your iPhone. These are the apps that can help you create GIFs easily and quickly — either from live shoots or photos/videos already in your gallery — as well as share them with your friends and family via social networks, messaging apps or via URL. This is a powerful and comprehensive animated GIF generator made by Apple Inc. This application helps you capture images and videos with the in-app camera then lets you combine image, video, and GIF into one perfect animation. 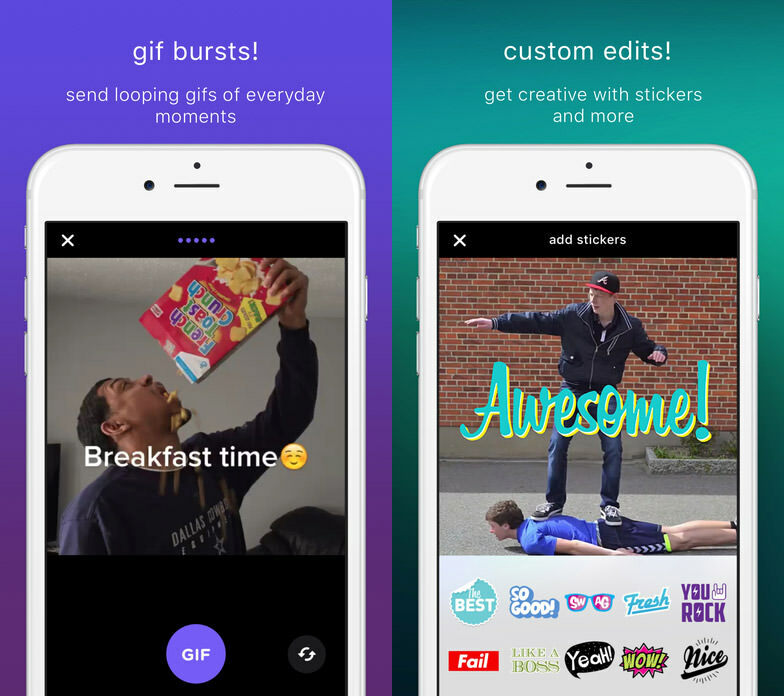 Without leaving the application, you can customize your GIF by using animated masks, effects, stickers and text. Animated masks and stickers are imported through Giply. Users can also export different filters, effects, text and captions to their PicArt Gallery. One very good thing about this application is that users will not bothered by a watermark. 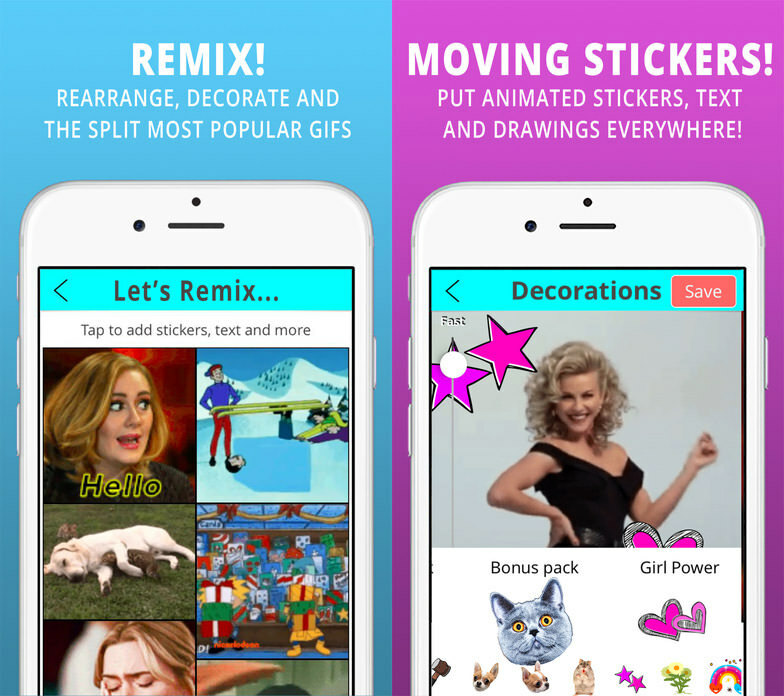 With HipGif, you can choose many kinds of animated stickers to add to your GIF file. These stickers and popular GIFs can be mixed with your own, and the pile is updated multiple times a day. Speed up, slow down, draw on your GIFs, add a filter, text or frame to any of your GIF and share them on Instagram as a video. You can snap multiple photos, or use any of the meme background templates available. The app is also great for making photo slideshows but best of all you can share easily to Facebook, Messenger, Twitter, WhatsApp and even via SMS. 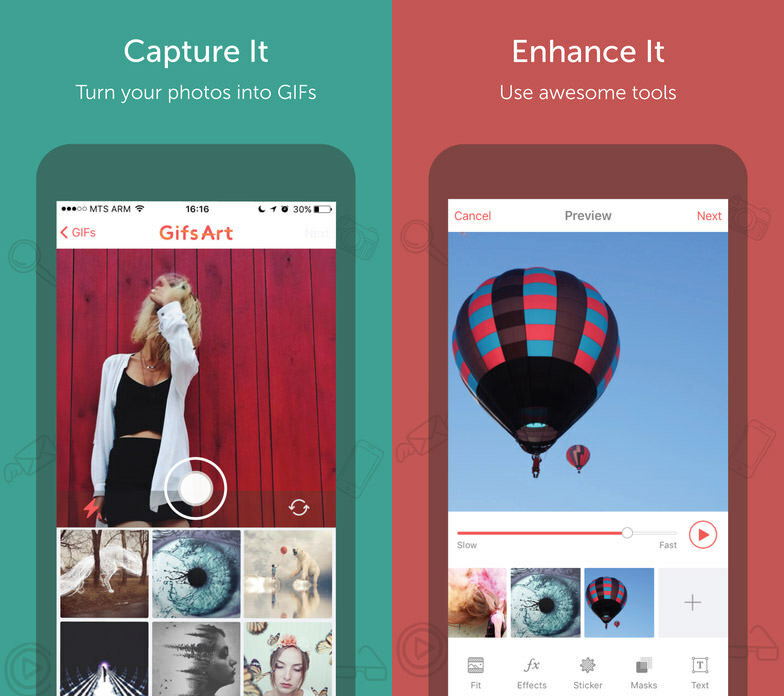 Share animated GIFS, memes, reactions through Gifo with your iPhone or iPad camera. 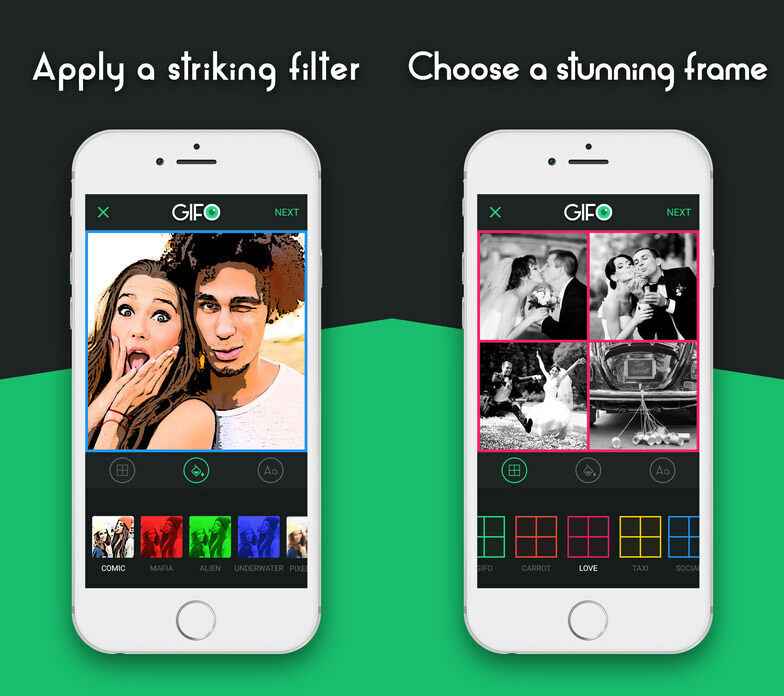 It makes it easy for you to make stunning animated collages, to speed up or slow down GIFs as what you want. Furthermore, you can make 4 GIFs in one go. 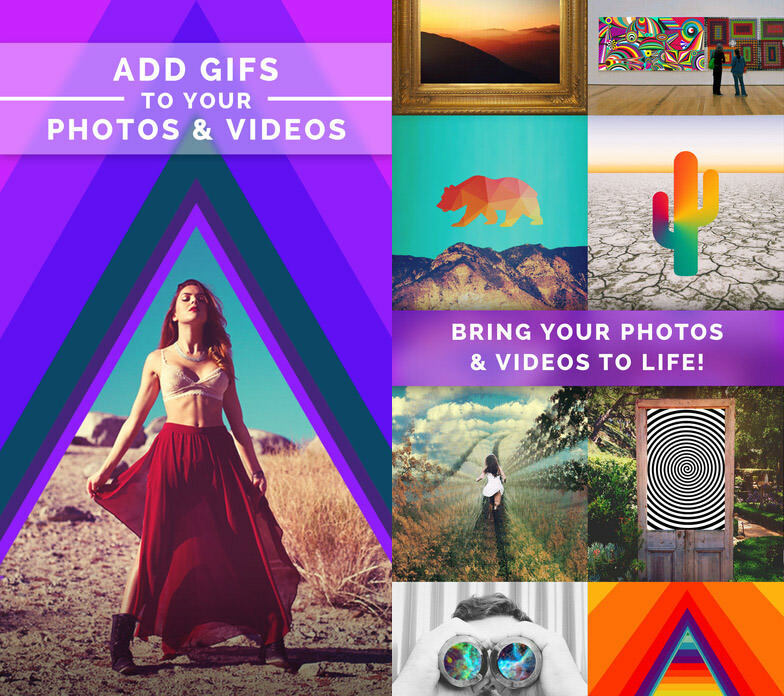 It also comes with cool filters, frames, colorful text and fonts that you can add to your GIFs. Your Gifo results can be copied without saving it first into the camera roll. Just directly paste it into any application you want to share it to. If you do want to save it into the camera roll, you can, in GIF form or as a video file. If you’re looking for a quick and easy way to trim, play backwards, have speed control and export your captured videos to GIF format, Lively can do all that and more. The catch is your exported GIFs will carry their watermark, which you can remove with a one-time purchase. Lively works with an iPhone 6S/6S Plus. The app comes with 3D Touch support. Its extensive editing features not only gives you full control of what to show and not to show others, but also lets you shrink the size of your GIF files, pick a single frame from a full video, and share to iMessage, Facebook Messenger, Twitter, Slack, Tumblr and many more. Not only is the video-taking easy, with this app you can also add image filters, transition effects, remove flickering effect which are a pain in slow motion shots, and easily share them on your favorite social network sites. Here are some examples on Instagram. Kanvas Lab lets you live life creatively, by allowing you to send GIF loops of your otherwise muundane everyday life. Apart from sending a GIF file, you can also send a message with a GIF looping in the background of your message. I’m sure you will be able to find ways to express yourself with these two combinations. Animated GIFs are recorded in 6 frames; if you need more, take a video message for up to 15 seconds instead. You can speed up or slow down the video message as you like. The app also has custom stickers, an artsy toolkit for additional sprucing up, and flipbook photo album that can be easily shared to your favorite social networks. Everything you can do with GIF, you can do with this app. Shoot in GIF, convert your own videos or YouTube videos to GIF, turn photos into GIF and add animated text or effects to it, all with this handy GIF-making tool. The app also lets you add animated text, save GIF as a video or share it to your favorite social networks. You can also get a URL for your GIF, to share with others. If you need a quick and easy way to make GIFs, you found it. 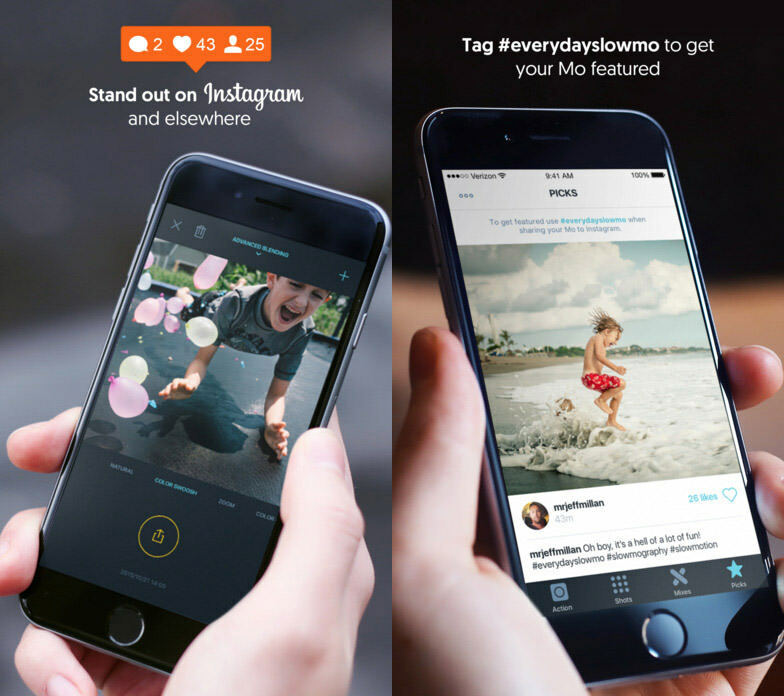 Vhoto will record your favorite moments on video and present them to you as a GIF. It will find the best highlight in your video before turning it into an awesome GIF. You can choose to record directly or choose an existing video to convert. For the best GIF loop result, trim your videos to find the best shot. After make your GIF, you can share to your friend on social media or send it within a text message. 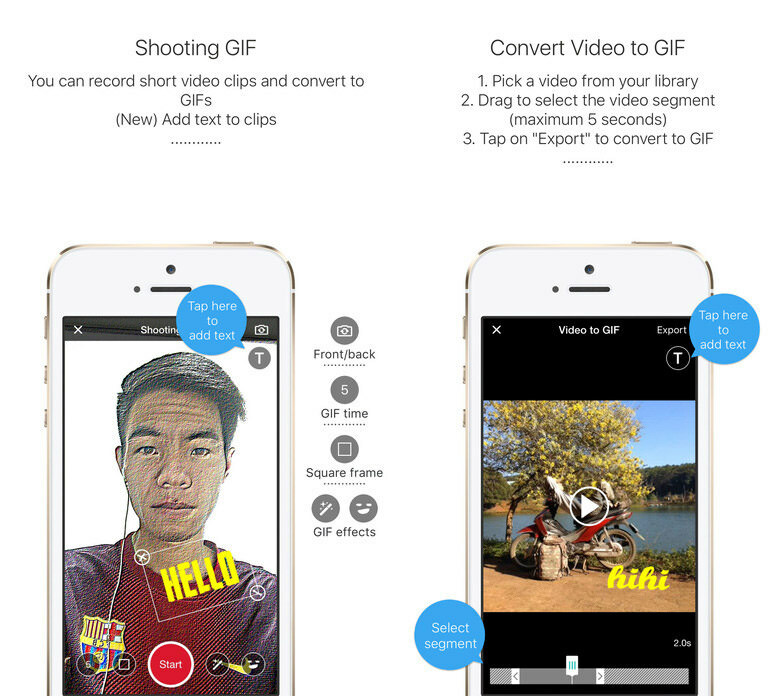 This free app overall gives you easiest way to convert video into GIF in a jiffy. ImgPlay brings to you who love to shoot in diferent modes – burst photos, iOS Live Photo or normal mode – as this app can turn your shots into GIF. You can edit your GIF before publishing it, by adding captions, editing frame sector/order, control speed/direction (forward, in reverse), and loop count. In the end you can export your creation into several GIF quality levels, or you can also export it into video to share easily on multiple social networks and messaging apps. 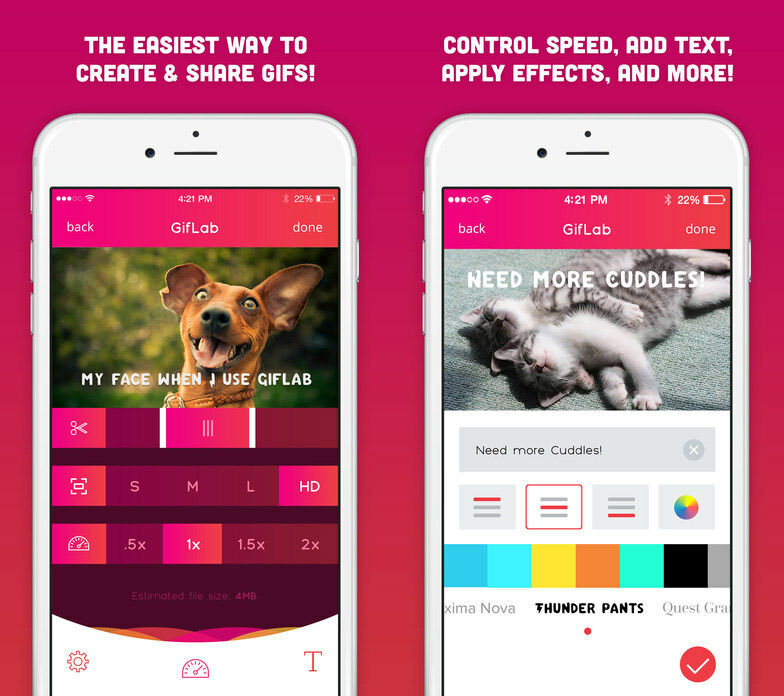 GifLab allows to to create GIFs on your iOS device with plenty of customization options. The app makes it easy to trim, adjust quality and speed, add text with dozens of nice fontfaces, and beautify images with its range of filters. 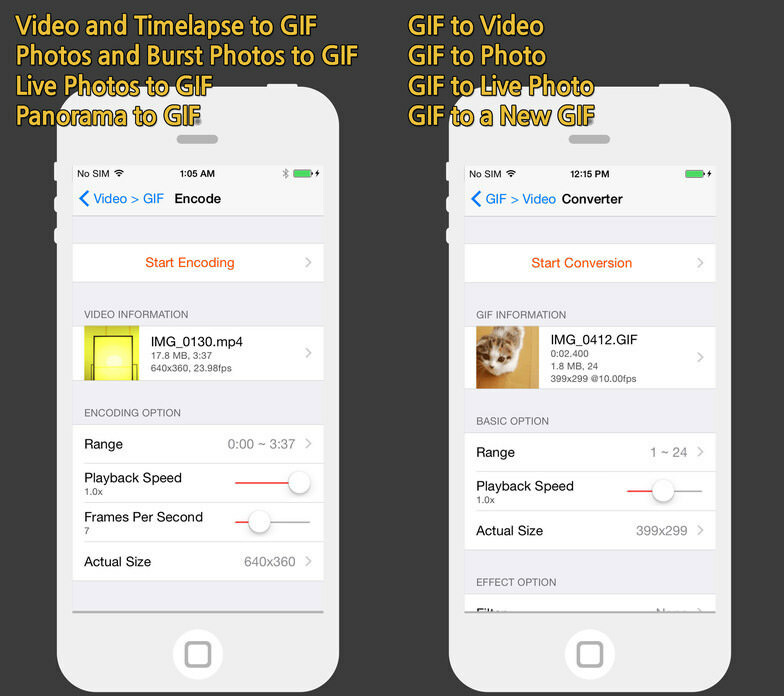 If you are a huge fans of Instagram, then GifLab can export GIFs into videos that are upload-ready. The GIFs can also be shared on social network sites, via messaging apps or group chats, and via URL. Previously a free app, now the app costs $1.99 to own. Watermarks and locks on filters and fonts have been removed. 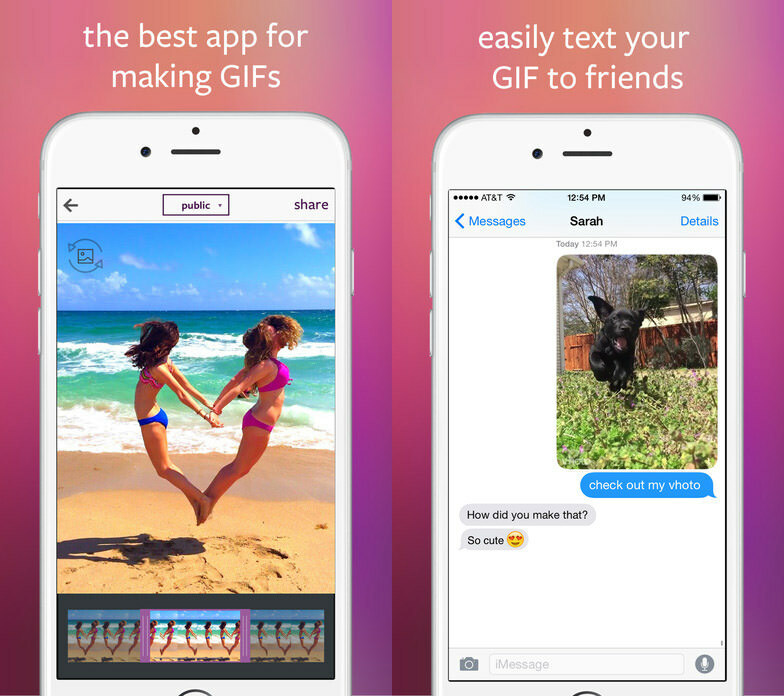 GIF Toaster is handy app to convert photos or video into animated GIF. It works for both iPad and iPhone. Just select the photo or video you want to convert to GIF then set encoding options such as range (which part of the video), play back speeds, number of frames per second, size of video then click Start Encoding. 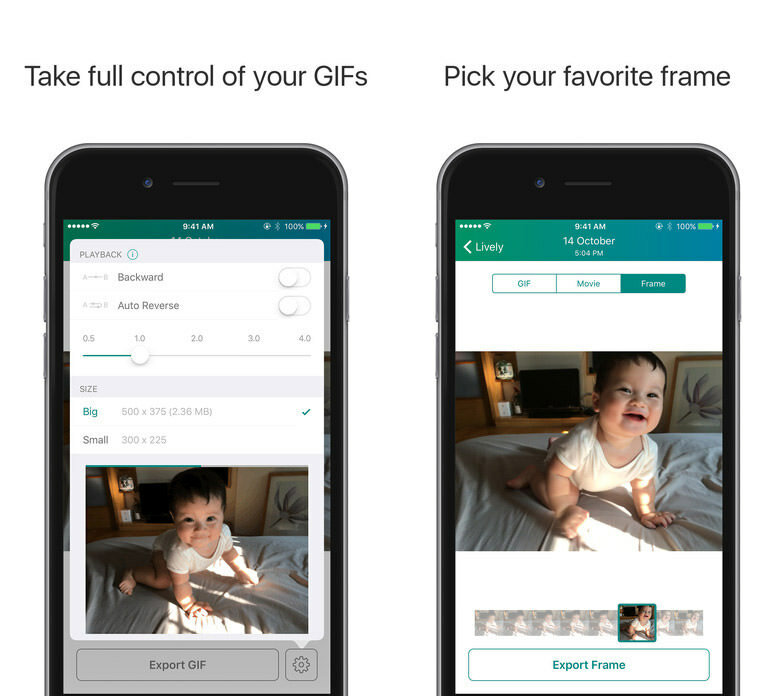 The app can convert GIF to video, photo, live photo or to new GIF. It can also do all that in batch mode (doing multiple at the same time). You can also share the resulting GIF via URL. If you are a creative person, then Gifx will give you space to create customized animated images. You can import photos and videos, and apply more than 200 GIF effects and over 100 masks to personalize your GIF. The files can be saved as a movie file or GIF file. You can share your GIF on popular social media you love later. There are other features available that are locked down by purchases, including being rid of the watermark, a graphics, pack, an export feature, high resolution feature and more. Check out their tumblr page to see what the app can do. 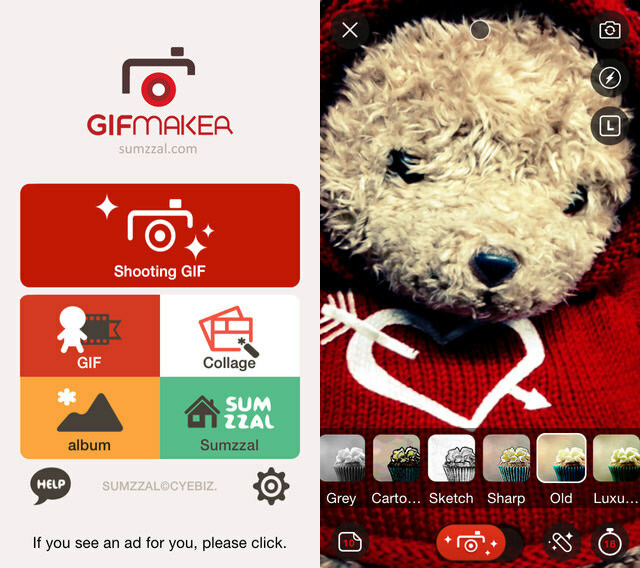 GIF Maker allows you to shoot your moments and save them in animated GIF format. You can create GIFs from your video shots from as short as 5 seconds to a maximum of 25 seconds. Alternatively, one chan choose to take a minimum of 10 photos to a maximum of 50 photos to turn into GIFs. Users can also create GIFS from pre-existing photos or videos in their camera gallery. The app also includes some effects that make your GIF look funny, bizarre or scary plus other cool effects.